Buffalo Mountain is a monadnock that rises a thousand feet (305 m) above the plateau a few miles west of the Blue Ridge escarpment. At 3971 feet (1211 m) asl this mountain is the highest on northwest-trending Buffalo Ridge and the highest on this part of the Blue Ridge. The entire area is an outstanding example of the convergence of Appalachian, southern and northern floras. The Mountain and much of the Ridge are now part of the State system of Natural Area Preserves. Geologic composition and structure are central to the origin of Buffalo Ridge, its flora, fauna and ecological circumstances. As mapped by the State (Rader. and Evans, 1993), bedrock of the Ridge is an ancient "dark greenish-gray coarse to fine-grained amphibolite, hornblende gneiss and schist." Based on our brief survey, Buffalo Ridge appears to parallel the rock schistosity or grain, with soft chloritic rocks at low elevations and more erosion-resistant rocks rich in silica and other hard minerals on Buffalo Mountain itself. The entire Ridge as observed by us appears to be rich in the ferromagnesium minerals that exert a major influence on the flora. A number of different macrohabitats are found on the Ridge and Mountain. Among these are low elevation mesic forests, cliffs, seeps, and the tundra-like and prairie - like openings which have been referred to as "glades" (Porter, 1975; Rawinski and Wieboldt, 1993) and occupy various positions on and immediately below the summit. These varied habitats have given rise to a remarkably diverse flora that contains a number of species rare in the southern Appalachians or indeed globally in some instances. Examples are such prairie grasses as Big Bluestem (Andropogon gerardi) and Yellow Indian Grass (Sorghastrum nutans) on the south-facing meadow below the summit, the rare Large-leaved Grass of Parnassus (Parnassia grandifolia) and the Appalachian endemic Gray's Lily (Lilium grayi) of seep areas. Others are Mountain Rattlesnake-root (Prenanthes roanensis), Fir Clubmoss (Lycopodium selage), Rocky Mountain Woodsia (Woodsia scopulina), Bog Bluegrass (Poa paludigena) and Mountain Sandwort (Arenaria groenlandica). Rawinski and Wieboldt (1993) classified the glade flora using the Braun-Blanquet tabular method (Westhoff and van der Maarel, 1973). Several of their communities, in particular their Juniperus virginiana- Quercus stellata/ Castilleja coccinea Association were not observed by us because they lie somewhat below the summit in areas not visited by us. Also, of the species listed above, only Mountain Sandwort is reported on here, although we were able to document many other species and interesting communities. Although the fauna of Buffalo Mountain is less well documented than the flora, an example that is closely related to the latter. a seldom-collected leaf beetle, was provided by Wheeler (1994). Our traverse began at the conspicuous saddle on the Ridge that may be reached by Route 727. From here it extended about 1.5 mile (2.4 km) to the summit. Our 6-23-98 traverse began near noon at the saddle elevation of 3080 feet (939 m) and extended about a mile (1.6 km) to near the 3400 foot (1031 m) level. Although an old woods road/trail was the locus of our observations, numerous excursions were made into the surrounding forest. Aspects along this route, which was mainly below the Ridge crest, were generally south to southwest. The canopy at the saddle was formed by mature Tuliptree, Black Locust, White and Northern Red Oaks, White Pine, Red Maple, Shagbark Hickory, Sassafras and, curiously, a single Yellow Birch. Very likely Black Birch was present as well, since unidentified birch seedlings were seen. Some Flowering Dogwood (Cornus florida) was present, but no shrubs were recorded. However vines were represented by abundant Virginia Creeper (Parthenocissus quinquefolia) and Poison Ivy (Rhus radicans). The mineral chlorite is abundant in the rock here and, where not deeply eroded, soils are reddish-brown mull, clay-rich and likely clay loam. Herbs successively noted along the initial short section of trail and in the adjacent forest were Daisy Fleabane (Erigeron annuus), Wavy-leaf Aster (Aster undulatus), White Wood Aster (A. divaricatus), Curtis Goldenrod (Solidago curtisii), Downy Wood Violet (Viola sororia), (Palmate-leaf Violet (V. palmata), the panic grass Panicum boscii, Mountain Oat Grass (Danthonia compressa) mainly at the trail edge, Upright Yellow Wood Sorrel (Oxalis stricta), Wide-leaved Joe-pye Weed (Eupatorium pupureum), Creeping Five-leaf (Potentilla simplex), Pale Indian Plantain (Cacalia atriplicifolia), Black Snakeroot (Sanicula canadensis), Common Many Knees (Polygonatum biflorum), Plume Lily (Smilacina racemosa), Hairy-jointed Meadow Parsnip (Thaspium barbinode), Yellow Pimpernel (Taenidia integerrima), the tick-trefoil Desmodium paniculatum, Bloodroot (Sanguinaria canadensis), Christmas Fern (Polystichum acrostichoides) and Rattlesnake Fern (Botrychium virginianum). Moving farther up the trail, we saw the dewberry Rubus flagellaris, heard a Wood Pewee (Contopus virens), followed by Large Summer Bluets (Houstonia purpurea) in bloom, then the mountain mint Pycnanthemum tenuifolium), Sweet-scented Bedstraw (Galium triflorum), the large arresting blooms of Poke Milkweed (Asclepias exaltata), Bottlebrush Grass (Elymus hystrix), Summer Grape (Vitis aestivalis), Hog Peanut (Amphicarpa bracteata), a species of jewelweed (Impaties sp), Smooth Sumac (Rhus glabra), Purple Bedstraw (Galium latifolium), Calico Aster (Aster lateriflorus), the hawthorn Crataegus flabellata, a species of blackberry with vague characteristics of Allegheny Blackberry (Rubus allegheniensis), Alternate-leaf Dogwood (Cornus alternifolia), a bittersweet, probably Celastrus scandens, Bitternut Hickory (Carya cordifolius) and Indian Turnip (Arisaema triphyllum). We now saw our first Black Oak, followed by Four-leaved Yam (Dioscorea quaternata), Black Cohosh (Cimicifuga racemosa) in bloom, Starry Campion (Silene stellata), Big-leaf Aster (Aster macrophyllus), Downy Serviceberry (Amelanchier arborea), Smooth Sweet Cicely (Osmorhiza longistylis), Wild Geranium (Geranium maculatum), Wild Lettuce (Lactuca canadensis), Cucumbertree (Magnolia acuminata), then Hairy Sweet Cicely (Osmorhiza claytoni), the first-noted American Basswood (Tilia americana), Black Birch, Bowman's-root (Gillenia trifoliata), Mealy Bellwort (Uvularia perfoliata) and heard the calls of an Ovenbird (Seiurus aurocapillus) and an unidentified Vireo. Appearing next were May Apple (Podophyllum peltatum) with particularly large, but unripe, fruit, the sedge Carex digitalis, a species of Pignut Hickory (likely Carya glabra), Witch Hazel, the tick-trefoil Desmodium glutinosum, Enchanter's Nightshade (Circaea quadrisulcata), a species of Gall of the Earth (Prenanthes sp), a small Black Cherry, Basil Balm (Monarda clinopodia), Large-flowered Trillium (Trillium grandiflorum) long past blooming, Black Raspberry (Rubus occidentalis) and the first-noted Chestnut Oak. A little farther along the trail we saw an unidentified Meadowrue (Thalictrum sp) and, on Poke Milkweed, a number of Great Spangled Fritillary (Speyeria cybele) Butterflies, then Wild Onion (Allium cernuum), Red Hickory Pignut (Carya ovalis), Maple-leaf Viburnum (Viburnum acerifolium), Canada Brome Grass (Bromus purgans), Deer Tongue Grass (Panicum clandestinum), Purple-top Grass (Triodia flava) and Mockernut Hickory (Carya tomentosa). We had now reached the first iron gate after having covered only a few hundred meters in our traverse. Continuing our gentle climb, we saw Leather-leaf Meadowrue (Thalictrum coriaceum) and the sedge Carex complanatus.. A spot inventory of the canopy here yielded Tuliptree, Red Maple, Northern Red and White Oaks, Shagbark Hickory, pignut hickory (likelyCarya glabra), American Basswood and White Ash, all mature, but not old. Also seen and heard was a male Scarlet Tanager (Piranga olivacea). These were followed by the beautiful annual ground cherry Physalis pubescens in bloom, Canada Violet (Viola canadensis), Early Meadowrue (Thalictrum dioicum), Ebony Spleenwort (Asplenium platyneuron), Broad-leaf Goldenrod (Solidago flexicaulis), Southern Bellflower (Campanula divaricata), Virgin's Bower (Clematis virginiana), Woodland Sunflower (Helianthus divaricatus), possible Arrow-leaf Aster (Aster sagittifolius) and more Great Spangled Fritillaries. We next saw the first Wild Sarsaparilla (Aralia nudicaulis), Whorled Loosestrife (Lysimachia quadrifolia), the panic grass Panicum latifolium, Revolute Meadowrue (Thalictrum revolutum) and Lovage (Ligusticum canadense), the last-named being an aromatic stand-out and tea. Canopy here consisted of Tuliptree, Red Maple and White Oak. We had the while been passing road/trail banks of a deep, rust-red-brown mull-type soil topped by a thin to non-existant forest floor-leaf cover. The surface of this soil had a pH in the range of 5 to 5.5. However we now observed a change in forest type with the appearance of more acid-disposed species. The canopy was formed by Northern Red and Black Oaks, Tuliptree, White Ash, Shagbark and Mockernut Hickories, Red Maple and Cucumbertree, with Flowering Dogwood in the understory. Deerberry (Vaccinium stamineum) represented the first appearance of ericaceae, while the ground flora consisted of Mountain Bellwort (Uvularia pudica), Wood Tickseed (Coreopsis major) and Late Purple Aster (Aster Patens). Soon the canopy trees became smaller, with Black Gum as an addition, and accompanied by Bowman's Root, Hairy Angelica (Angelica venenosa), Carex virescens, Hairy Panic Grass (Panicum dichotomum) and stunted plants of Hairy Skullcap (Scutellaria elliptica var elliptica), here in bloom. At near 3200 feet (976 m) asl the trail leveled and began to approximate the contour on a south-southwest aspect. Here were White and Chestnut Oaks, American Chestnut sprouts, the first Striped Maple (Acer pensylvanicum), Upland Low Blueberry (Vaccinium pallidum), White Aster (Aster infermus), Cut-leaf Goldenrod (Solidago arguta), Golden Alexanders (Zizia aptera), the forest grass Brachyelytrum erectum, Squaw Root (Conopholus americana) and Entire-leaved Yellow Foxglove (Aureolaria laevigata). Following these were abundant Tuliptree and a bush of the alien Spiraea japonica in bloom. After a slight left turn on a down-slope we saw Mealy Bellwort andCarex laxiflora under a canopy of Tuliptree, Cucumbertree, Northern Red Oak and Black Birch, then the first Mountain Holly (Ilex montana), Dutchmans Pipe vine (Aristolochia macrophylla) and, a little farther on, Pasture Rose (Rosa carolina), then more Large-flowered Trillium, the upland forest bullrush Scirpus vericundus, more Smooth Sweet Cicely and Flame Azalea (Rhododendron calendulaceum). Also seen here were the fungi Crepidotus applanatus and a species of Pholiota. Continuing under a canopy of Tuliptree, Northern Red Oak, Pignut Hickory and Red Maple, we heard and/or saw Scarlet Tanager, Wood Pewee, Red-eyed Vireo (Vireo olivaceus), American Redstart (Setophaga ruticilla) and House Wren (Troglodytes aedon), then Hophornbeam (Ostrya virginiana) and a small group of Shagbark Hickory. Now, at a distance off the trail, we saw an isolated but vigorous clump of Catawba Rhododendron (Rhododendron catawbiense) accompanied by Upland Low Blueberry and Wild Lily of the Valley (Convallaria montana), signifying continued acidic terrain under a canopy that included Mockernut and Red Hickories and American Basswood.Also seen were a little Wild Hydrangea (Hydrangea arborescens), Hairy Disporum (Disporum lanuginosum) and a green-capped Russula fungus of undetermined species. The soil here was reddish with a slightly developed mor. The trail now ascended slightly and we noted a Clintonia, likely Clintonia umbellulata, and the fungi Sarcocypha occidentalis, Tremellodendron pallidum and a Clitocybe. Here we also saw Horse Balm (Collinsonia canadensis) and Golden Ragwort (Senecio aureus) and once again heard a Scarlet Tanager. We then came upon an unusual ecological vignette, namely a small heap of just the wings of a number of Luna Moths (Actia luna) that had probably been accumulated in a night by some predator such as an owl. Other faunal signs were the call of an Ovenbird and the sighting of a Chipmunk (Tamias striatus). American Basswood and Red Maple were now prominent in the canopy and accompanied by White Avens (Geum canadense) and the fungiCollybia dryophylla and Trametes versicolor. Following was a canopy dominated by Shagbark and Pignut Hickories, White Ash, Cucumbertree and Tuliptree, with the fungus Polyporus badius found on a dead Basswood. On the now steepening slope we identified the wedge grass Sphenopholis obtusata, Virginia Strawberry (Fragaria virginiana), May Apple (here too with unusually large fruit), the fungi Devil's Urn (Urnula craterium) and a species of Agaricus, then Spreading Dogbane (Apocynum androsaemifolium) Blue Cohosh (Caulophyllum thalictroides) in its only appearance, abundant Tuliptree and an eight inch (o.2 m) Serviceberry. Although they had probably been present in areas inventoried earlier, we now noted for the first time land snails that exceeded an inch (2.5 cm) in diameter. Other fauna seen here were a Slimy Salamander (Plethodon glutinosus) and a Raven (Corvus corax), while additional fungi were Hohenbuehelia petaloides and Lycoperdon pyriforme. As we terminated our traverse we noted American Hazelnut (Corylus americana) and Wild Ginger (Asarum canadense). As we retraced our steps to our point of origin we saw the following species we had missed during our traverse: first a single Fraser Magnolia (Magnolia fraseri), a patch of Black Haw Viburnum (Viburnum prunifolium), the fern Blunt-lobe Woodsia (Woodsia obtusa) in close association with Smooth Rock Cress (Arabis laevigata) and a rock that bore the moss Hedwigia ciliata; then farther down, Marginal Shield Fern (Dryopteris marginalis), Pennsylvania Blackberry (Rubus pensilvanicus) and Small's Ragwort (Senecio smallii). A considerable number of the large land snails were also seen during our return. Our traverse initiated on the morning of 6-24-98 continued where that of the previous day ended, where the trail steepened substantially, near a second steel gate. On the approach to the gate at near 3400 feet (1037 m) asl, we were attracted by the purple blossoms of Leatherflower (Clematus viorna), the first-seen Wood Nettle (Laportea canadensis) and the shrub Chokecherry (Prunus virginiana), which is usually found at these or higher elevations at this latitude. Here began a rich colluvial forest that is likely a consequence of the steep slope that facilitates access to subsurface waters and earth movements. The canopy is dominated by Northern Red Oak, Tuliptree (here at a rather high elevation for the species), Black Birch, American Basswood, Cucumbertree and Black Locust. A rich blanket of tall herbs covered the south-facing slope. These included Poke Milkweed, Deer Tongue Grass, Broad-leaf Goldenrod, Smooth Sweet Cicely, Nodding Fescue (Festuca obtusa), Common Three-seeded Mercury (Acalypha rhomboidea) and Carrion Flower (Smilax herbacea), while among lower herbs were Smooth-forked Chickweed (Paronchia canadensis), Clearweed (Pilea pumila), Lowland Brittle Fern (Cystopteris protrusa), Hairy Heuchera (Heuchera villosa var villosa), the sedge Carex cephalophora and, in particular, Large-flowered Bellwort (Uvularia grandiflora), always an indicator of the richest soils. Also in this category were luxuriant vines of Canada Moonseed (Menispermum canadense). Nearby, larvae of the Pipe Vine Swallowtail Butterfly (Papilio philenor) properly fed upon Dutchman's Pipe Vine. Continuing our climb, we saw abundant White Ash, Northern Red Oak, a single large Red Maple, Carex radiata, C. virescens and Basil Balm and heard an Ovenbird and a Solitary Vireo (Vireo solitarius). These were followed by Nimblewill (Muhlenbergia schreberi), Bottlebrush Grass, Wild Hydrangea, the goldenrod Solidago arguta var boottii, Hispid Buttercup (Ranunculus hispidus var hispidus) and then the beautifully complex notes of a Rose-breasted Grosbeak (Pheucticus ludovicianus). Soil here ranges from dark brown to almost black, deep mull with little or no dead leaf cover. No Red Maple was seen and there was an increase in White Ash and Basswood. We now reached a sharp right turn in the trail, corresponding on the map to an elevation of 3520 feet (1074 m) asl. At the base of a steep bank Spiderwort (Tradescantia ohioensis) was in bloom in association with Panicled Aster (Aster simplex or A. lanceolata) and on the slope above there was abundant Striped Maple. 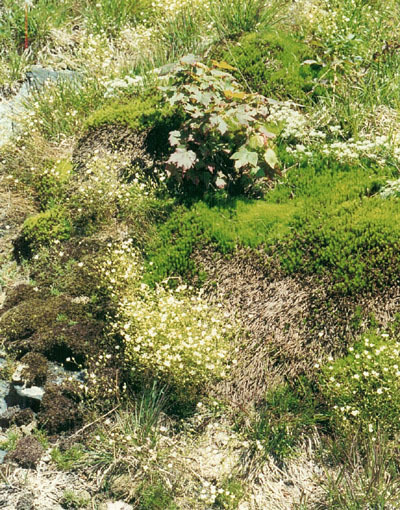 On rock and moist shaded soil of the bank grew the mosses Eurhynchium hians, Mnium cuspidatum, Amblystegium trichopodium,Brachythecium curtum, Atrichum angustatum and species of Bryum and Rhynchostegium, while rotting wood harbored Entodon compressus and, the base of an oak, E. brevisetus and the liverwort Frullania eboracensis.. A Black-throated Blue warbler (Dendroica caerulescens) sang from a canopy dominated by American Basswood and White Ash, with Shagbark Hickory, sprouts of American Chestnut and Dutchman's Pipe vine. As we moved along the gently climbing trail toward the northeast,we again heard a Red-eyed Vireo, saw a small band of Juncos (Junco hyemalis) and a Turkey Vulture (Cathartes aura) soaring above the treetops. Here,benefitting from the steep colluvial slope, was more Large-flowered Bellwort as well as the first-noted Virginia Waterleaf (Hydrophyllum virginianum). Localized in the vicinity of a rock bearing the moss Hedwigia ciliata was Marginal Shield Fern and Hairy Heuchera, while nearby grew Carex appalachica, Hairy Sweet Cicely, Leather Flower, Blunt-lobed Woodsia, Dotted St, Johns-wort (Hypericum punctatum) and Climbing False Buckwheat (Polgonum scandens). Northern Red Oak joined White Ash and American Basswood in the canopy, Witch Hazel was conspicuous in the shrub layer and Ovenbird calls were frequent. At this point there was a sharp turn to the left and the trail headed directly up the ridge crest in a steep climb toward the summit. Here a deep gully along the trail was evidence of severe erosion and a conspicuous species at the trail edge was the alien Tall Oatgrass (Arrhenatherum elatius). A little farther up the slope an American Basswood was covered by flower buds soon to open. Other species lining the ridge crest trail were a large cluster of blooming Leather Flower, Maryland Figwort (Scrophularia marilandica), luxuriant Flowering Raspberry (Rubus odoratus) also in bloom, Purple Bedstraw, Bloodroot, Virginia Strawberry, Curtis Goldenrod, Shagbark Hickory and Red Maple in a reappearance. An Indigo Bunting (Passerina cyana) was also seen. A little higher there was abundant Wrinkle-leaf Goldenrod (Solidago rugosa), Goats Beard (Aruncus dioicus), Wide-leaved Joe-pye Weed, Black Cohosh, Wirestem Muhley (Muhlenbergia frondosa), American Basswood, Blunt-lobed Woodsia, Smooth Gooseberry (Ribes rotundifolium), Black Raspberry and Wild Hydrangea. Yet higher there were still abundant mesic herbs, Striped Maple, Black Cherry of poor form, increasingly prominent Black Birch, Red Hickory, Hophornbeam, Big-leaf Aster, Broad-leaf Goldenrod, the first Hay-scented Fern (Dennstaedtia punctilobula), Pennsylvania Blackberry, Flowering Raspberry and Choke Cherry. Continuing upward we saw the first Great Chickweed (Stellaria pubera), a few Yellow Birch, flamboyantly blooming Fire Pink (Silene virginica), Southern Bellflower, abundant Black Birch and Virginia Creeper in increasingly rocky soil. These were followed by the only-seen White Basswood (Tilia heterophylla), the goldenrod Solidago altissima, Whorled Loosestrife, more American Basswood, Northern Red Oak, a few more Yellow Birch, substantial Black Birch, Shagbark Hickory, Lady Fern (Athyrium filix-femina), scattered small Red Maple and Catawba Rhododendron. Also noted at the trail edge were the alien Canada Bluegrass (Poa compressa) and large patches of Deer Tongue Grass and Wrinkle-leaf Goldenrod. As the trail rose steeply to the summit, trees were more stunted, rounded in form, with more dead limbs. White Oak was more abundant than below, and its leaves were in some cases consumed to fragments, presumably by insects. Common also were White Ash, Black Cherry, Shagbark Hickory and Northern Red Oak. Catawba Rhododendron and Witch Hazel dominated the shrub layer, Very near the summit increasing aridity and acidity were apparent with the appearance of Deer Berry, American Chestnut sprouts, Saw Brier (Smilax glauca), Whorled Loosestrife and especially Rattlesnake Weed (Hieracium venosum). However, Smooth Gooseberry and Wild Geranium were also here. A Black Vulture (Coragyps atratus) soared above. Additional fungi, later identified by R. Hunsucker from this traverse through the Ridge forest, were Tylopilus felleus, Boletus bicolor, Pleurotus ostreatus, Leucopaxillus albissimus, Lycoperdon perlatum, L. marginatum and a species of Inocybe. 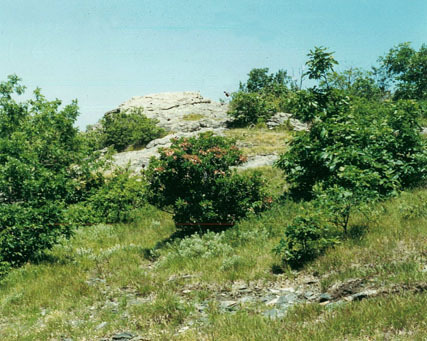 The topography of the summit of Buffalo Mountain is rough, with large areas of exposed rock. This rock, as might be expected, appears more resistant to chemical weathering and erosion than that lower on the Ridge. It appears to contain less, if any, chlorite, more mica-which glistens in the sunlight- quartz and feldspar. There is a distinct difference between the floras of the gentle south slope and the steeper north. However, these were explored only very near the summit. Trees and shrubs of the summit have low, rounded forms for the most part, are relatively widely spaced on the south slope, but densely clustered on the north. White Oak appeared to be the most common tree, but Northern Red Oak, Black Birch, White Ash, Shagbark Hickory, Red Maple, Black Cherry, Big-toothed Aspen (Populus grandidentata), Cucumbertree, Striped Maple, Mountain Holly, Mountain Ash (Sorbus americana), the hawthorn Crataegus flabellata, Smooth Serviceberry (Amelanchier laevis) and Carolina Hemlock (Tsuga caroliniana) also occur. Shrubs are also diverse, and include abundant Mountain Laurel, Catawba Rhododendron, Witch Hazel, Black Chokeberry (Aronia melanocarpa), Wild Hydrangea, Ninebark (Physocarpus opulifolius), Bush Honeysuckle (Diervilla lonicera), two upland willows, Salix humilis and the dwarf S. occidentalis, Pasture Rose, Minnie-bush (Menziesia pilosa), Deer Berry and Upland Low Blueberry. Common Greenbrier, Hispid Greenbrier (Smilax hispida) and Dewberry (Rubus sp) were vines noted. Mountain Ash, Mountain Holly, Smooth Serviceberry, Bush Honesuckle, Black Chokeberry, Minnie-bush and the banner-shaped Carolina Hemlock appeared to be concentrated on the north slope just below the summit, but no attempt was made to survey the north slope below this level. The oaks, Shagbark Hickory, Witch Hazel, Mountain Laurel, Aspen, the willows and blueberries were found distributed thinly on the south slope of the summit area. Herbs found on the upper north slope were Bunch Flower (Veratrum parviflorum), Canada Mayflower (Maianthemum canadense), Mealy Bellwort, Galax (Galax aphylla), Wild Sarsaparilla, Lady Fern, White Aster, Bowman's Root and a large type of Common Many Knees (Polygonatum biflorum). 6-24-98, Buffalo Mtn. summit flora, with Arenaria groenlandica in bloom, Polytrichum sp. The following herbs were distributed in open areas: Oat Poverty Grass (Danthonia spicata), Mountain Oat Grass, Silver Whitlow-wort (Paronichia argyrocoma) in bloom, Starved Panic Grass (Panicum depauperatum), the dwarf dandelion Krigia virginica, the aster Aster solidagineus, Michaux's Saxifrage (Saxifraga michauxii), Rock Fern (Polypodium virginianum) on rock and quite stunted, Mountain Spleenwort (Asplenium montanum) also on rock with Rock Fern, Hay-scented Fern, Carex pensylvanica, Three-toothed Cinquefoil (Potentilla tridentata) in bloom, Creeping Five-leaf also in bloom, Fire Pink in bloom, Whorled Loosestrife, Deer Tongue Grass, Small's Ragwort (Senecio smallii), Little Bluestem (Andropogon scoparius), an unidentified Poa, Canada Bluegrass, Wood Tickseed, White Heath Aster (Aster pilosus), the alien Piedmont Bedstraw (Galium pedmontanum), Southern Bellflower, Sessile-leaved Bellwort, Wild Peppergrass (Lepidium virginicum), Trail Rush (Juncus tenuis), Daisy Fleabane (Erigeron annuus), the goldenrod Solidago arguta var arguta, Wood Anemone (Anemone quinquefolia), Arrow-leaf Aster, Large Summer Bluets, Big-leaf Aster, White Snakeroot (Eupatorium rugosum), Yellow Stargrass (Hypoxis hirsuta) in bloom, Thyme-leaved Bluets (Houstonia serpyllifolia), Rock Spikemoss (Selaginella rupestris), Mountain Sandwort (Arenaria groenlandica) in bloom, Hispid Goldenrod (Solidago hispida), Balsam Squaw-weed (Senecio paupercaulis), Woodland Sunflower, Orangegrass (Hypericum gentianoides), Stiff Aster (Aster linariifolius), Hairy Panic Grass (Panicum lanuginosum var implicatum) (usually an inhabitant of wet woods and bogs), Round-fruited Panic Grass (P. sphaerocarpon), a few plants of the medicinal Colic Root (Aletris farinosa) in bloom, Sweet Vernal Grass (Anthoxanthum odoratum), the native variety of Yarrow, Achillea milifolium var lanulosa and Umbilicate lichens. Cerotodon purpureus-on rock and soil, (cosmopolitan). Tortella humilis-on rock and soil. Dicranella hiliariana-on soil,(southern coastal plain species). P. commune var periguniale-on soil. 6-24-98, Buffalo Mtn. Summit flora with Salix occidentalis and Mountain Laurel. Certain species, as Poverty Grass, Starved Panic Grass, Silver Whitlow-wort, Michaux's Saxifrage, Rock Fern, Mountain Spleenwort, Rock Spikemoss and a number of mosses appeared to occur on rocks and rocky soil in the highest areas, while Mountain Sandwort, Three-toothed Cinquefoil and Polytrichum mosses formed dense mats on the south slope. An example is a community of Mountain Sandwort, Polytrichum piliferum andP. commune.. In some places seedlings or stunted shrubs of Red Maple were present in this community. Elsewhere also, on the south slope of the summit, small clumps of Salix occidentalis mingled with Upland Low Blueberry in the shelter of Mountain Laurel, other shrubs and low trees. Quite generally, on this slope shrubs and trees were only a few meters high and spaced 50 feet (15 m) or so apart. Fauna noted on the summit included large soaring birds such as Turkey and Black Vultures, a Redtail Hawk (Buteo jamaicensis) and Ravens, as well as Towhees (Pipilo erythrophthalmus), Gold Finches (Sinus tristis tristis), Indigo Bunting, Brown Tharasher (Toxostoma rufum rufum), Mournig Dove (Zenaidura macroura) and Ruby-throated Hummingbird (Archilochus colubris). A group of butterflies on the edge of the summit opening included Mourning Cloak (Nymphalis antropa), Pipe Vine Swallowtail and Tiger Swallowtail (Papilia glaucus). The flowers of Mountain Sandwort appeared to be patronized mostly by a variety of small bees and flies, some of metallic hue, while small lepidoptera seemed to favor Silver Whitlow-wort. The Ridge forest consists of at least three types as related to topography. The lowest forest encountered is mesic but somewhat acidified by vertical leaching as a consequence of modest slopes along the trail. As noted, several sub-types of this forest are present. The second type, on and beneath steep slopes, is a rich colluvial type that derives nutrients from seeps and earth movement which brings less leached soil to the surface. It is characterized by such herbs as Large-flowered Bellwort and the virtual absence of acidiphile species such as Red Maple. The third forest type, just beneath the summit, appeared from its flora, to be the most acidic, likely as a consequence of shallow, rocky soil, less steep slopes and exposure to rain water rather than seeps. This interpretation appears to be supported by our comparison of the pH of the chloritic suspension from the schist with that of the leached soil as reported earlier. The pH of the schist material was a half to a full unit higher than that of the soil. Thus water passing through these rocks for some distance might well be enriched in bases such as calcium, magnesium and other nutrients relative to solutions confined to shallow depths. The summit area also appears to be a dominantly acidic environment as a consequence of shallow, rocky soils, low relief, perhaps more siliceous rocks than at lower elevations and more direct exposure to precipitation. Thus, while the summit flora includes Little Bluestem and acidiphiles, seeps at lower elevation contain Big Bluestem, Largeleaf Grass of Parnassus and other plants more at home in circumneutral or alkaline environments. These relations parallel those observed by us in the Ridge forest. Other than the effects of pH and nutrient availability, the summit floras are likely the result of the interplay of a number of climatic factors such as temperature, exposure to drying winds, sunlight and rapid temperature changes. The impressive diversity of these floras-amounting to at least ninety and perhaps considerably more vascular plants and an unknown number of bryophytes and lichens-implies a corresponding number of niches or stability fields. By and large species that can withstand severe drying, exposure to winds, sunlight and rapid temperature changes seem to be favored, The "tree line" here is thus more likely the consequence of these factors than low temperatures-which, in any case are not typical of these mountains. Although the premier species here are the high Arctic-ranging Mountain Sandwort and Tree-toothed Cinquefoil, these also appear to be favored by other than low temperatures, and other boreal species occur in low numbers. The same appears true of the high montane Michaux's Saxifrage and Silver Whitlow-wort. Yet our survey was anything but exhaustive, and a number of cold-climate disjuncts may have been missed. Porter, D. M., 1975. The flora and vegetation of Buffalo Mountain, Floyd County, Virginia. Unpublished report on file at Massey Herbarium, Virginia Polytechmic Institute and State University, Blacksburg, Va. 21 pp. Rader, E. K. and N. H. Evans. editors.1993. Geologic Map of Virginia - expanded explanation. Virginia Division of Mineral Resources. Charlottesville, Va.
Rawinski, Thomas J. and Thomas F. Wieboldt, 1993. Classification and Ecological Interpretation of Mafic Glade Vegetation on Buffalo Mountain, Floyd County, Virginia. Banisteria no. 2, 3-10. Westhoff, V. and E. van der Maarel. 1973. The Braun - Blanquet Approach. pp 616 - 726 in R. H. Whittaker, editor. Handbook of Vegetation Science. Junk. The Hague. Wheeler, A. G. Jr. 1994. Diabrotica cristata, a Seldom-Collected Leaf Beetle, Found on Buffalo Mountain, Floyd County, Virginia (Coleoptera: Chrysomelidae) . Banisteria, No. 4, 28-29.